The situation in Sabarimala has been further aggravated by the arrival of Trupti Desai, the anarchist from Pune to enter Sabarimala when the temple doors are opened for Mandala Pooja. 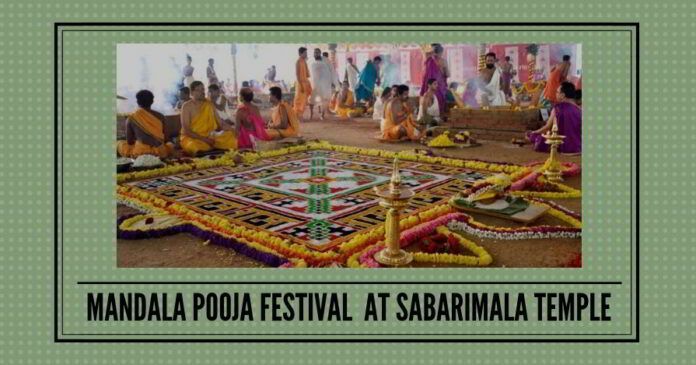 With hardly hours remaining for the commencement of the Mandala Pooja festival, Sabarimala Temple and premises in the Western Ghats of Kerala present the image of a battled-scarred region. More than 3,000 riot police including 900 women cops have been deployed all over the temple and the eyes of the policemen are scanning each and every devotee entering the premises from Pamba. Devotees on their way to Sabarimala should never utter the word Swamy lest police would assault you and file criminal complaints against you. Better address Lord Ayyappa as Comrade Ayyappa or Brother Dharma Sastha. Behra a converted Christian is infamous for his hatred for Hindus. He has allegedly personally handpicked Brahmin constables and sub-inspectors to work as his orderlies and domestic servants. Last evening he also held a secret parley with representatives of Asianet TV, Manorama TV, Mathrubhumi TV and News 18 (channels which are known as the loudspeaker of chief minister Ponarayi Vijayan) and took all of them with him to the temple. Janam TV and Amritha TV, the two news channels which aired non-stop the brutal police attack on the devotees during the last 30 days were booted out and have been asked not to come to the Sannidhanam. Devotees are upset over the arrival of Behra at the shrine. The situation in Sabarimala has been further aggravated by Friday early morning by the arrival at Kochi International airport of Trupti Desai, the anarchist from Pune to enter Sabarimala when the temple doors are opened for Mandala Pooja. 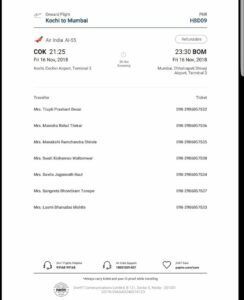 Desai accompanied by six females from Pune reached the airport by 4.45 hrs in the morning. But she and her associates have not been allowed out of the airport as hundreds of Ayyappa devotees have gathered outside the airport reciting Ayyappa Saranam hymns condemning the evil designs of this self styled devotee of Lord Ayyappa. Though Desai and her associates have been trying to woo the protesters with their voluptuous looks and bewitching smiles, none of us will fall for their pranks,” said Gireesh, one of the devotees waiting outside the airport to prevent the movement of Desai and her batch of 6 six females. The 2018-19 Sabarimala season is being seen as a Festival of Harvest as the church, communists and civil rights activists are planning massive evangelisation drive all over the Sabarimala. The Kerala Government in its affidavit filed in Kerala High Court had stated that Sabarimala is no more a Hindu place of worship. Next articleAircel-Maxis Sanction for Prosecution: Is Accused Chidambaram blackmailing Finance Minister Arun Jaitley? UPA government has already finished converting most of the metro cities… (Chennai, Mumbai, Kolkata -even before with Teresa, Delhi, Hyderabad) etc using her churches and influence. Thiruvanamalai, Madurai, Palani, Tanjore… kanniyakumari all are already targeted…. All famous Hindu temples are the target of these conversion groups… They get land outside city, mostly in remote villages…..
(From NGO funds, college n schools run by missionaries they tax separate funds for their trusts along with fees… Etc… They are the largest landowners in india— but no media will talk about this… Because this will create awareness among Hindus and dangerous for them… ) Set up small schools with the influence they have in government with the Christian representatives, set up a church…call all the neighbouring area people to churches, assuring education to their kids and better benefits…. Hindus should be very careful with these satanic people who are out there to destroy peace loving Hindus using their innocence and tolerance. Even in srivilliputhur they have done a lot of conversions…where Andal temple is there…and the neighbouring villages…. Government supports their schools with funds, gives money for renovating their churches, gives money for their fishermen etc…. Knowingly or unknowingly all these will come to light sooner or later… My only wish is that people wake up before it’s too late. Already they have converted cine media people….